Seattle Students Come to Stok. Siddhartha School welcomed 10 students and two teachers from the Bush School, Seattle, Washington. The students were received warmly with white katak scarfs, a student-written “welcome” poem, and a traditional welcome dance performance. The aim of the students’ visit was a cultural exchange, and it offered an immersive homestay experience for the Americans in Ladakh. Both the Bush and Siddhartha Schools share a common curriculum course called Social Emotional Learning, a social science module that teaches meditation, ethics, and the advantages of altruistic behavior. Over the course of the 10-day trip, the visiting students attended classes, meditation, and music activities, and they toured local points of interest. They also received instruction on local dance customs and planted seedlings in a symbolic effort to commemorate the growth of a budding relationship between the schools. Siddhartha School thanks all who sponsored the trip, and all who hosted and helped with entertaining the guests. And most of all, we thank the Bush School for sending their teachers and students to us. Photos: (above, top) The Bush School exchange students start the “Bush School Plantation” as a commemorative friendship garden at the Siddhartha School. 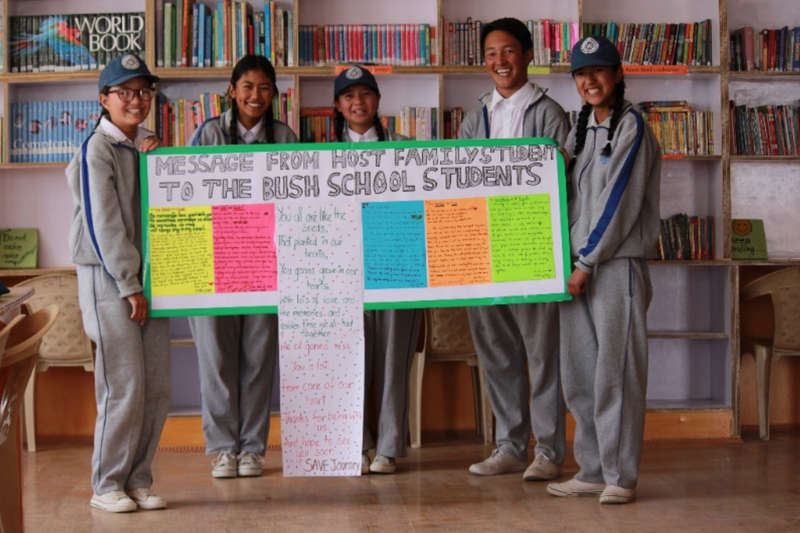 (above, bottom) Siddhartha School students hold a “welcome” poem and banner that was presented to the visiting students upon their arrival from Seattle, Washington.